The plant and animal life of Arizona is as varied as its topography and climate. Native species include more than 11,000 insects, 4,000 plants, 475 birds, 130 mammals, 90 reptiles, 80 fishes, and 20 amphibians. In addition, Arizona has 56 threatened or endangered plants and animals, as well as exotic and invasive species. The Sonoran Desert of Arizona is considered the most biologically diverse desert in the world. Animals that live in the desert include jackrabbits, cottontail rabbits, rock squirrels, ground squirrels, kangaroo rats, mice, coyotes, javelinas (wild pigs, pronounced “ha-va-lee’-na”), mule deer, bighorn sheep, mountain lions, bobcats, and bats. Birds include hawks, eagles, vultures, quail, roadrunners, doves, cactus wrens, thrashers, woodpeckers, owls, hummingbirds, and cardinals. Poisonous creatures that come out at night in summer are rattlesnakes, tarantulas, scorpions, and black widow spiders. There are also several varieties of lizards and other reptiles including the horned toad, desert tortoise, and Gila monster. Vegetation consists of paloverde and mesquite trees, ironwood trees, Joshua trees, creosote bushes, saguaros, prickly pear, cholla (“choy’-ya”), barrel cactus, organ pipe cactus, jojoba (“ho-ho’-ba”), agave, yucca, brittlebush, annual grasses and colorful spring wildflowers. The Palm Canyon Trail at the Kofa National Wildlife refuge is one of the only places where native California fan palms, Washingtonia filifera, can be seen in Arizona. In the mountains and forests of Arizona there are ponderosa pines, aspen, cottonwood, sycamore, willow, walnut, maple, oak, Douglas fir, spruce, juniper, and pinion pine. Wild turkey, mountain lions, deer, elk, pronghorn antelope, bears, raccoons, and skunks roam the forests and grasslands in the state. In 1889, American naturalist C. Hart Merriam studied the distribution patterns of plants and animals from the bottom of the Grand Canyon (elevation 2,400 ft.) to the top of Humphreys Peak (elevation 12,633 ft.). Merriam discovered that for every 1000 feet gain in elevation, the temperature drops 3 degrees F and the precipitation increases. Thus, hiking from the Grand Canyon’s lowest point to Point Imperial on the North Rim is like traveling from Sonora, Mexico to the Arctic coast of Canada in its climatic change. 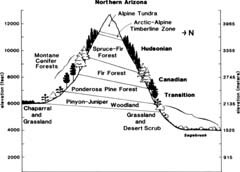 As one climbs up a mountain or “sky island” in Arizona such as Mount Graham or the Santa Catalina Mountains, one will encounter different kinds of plants and animals at each stage in elevation. For example, the 25-mile drive up Mt. Lemmon in Tucson crosses five of Merriam’s six vegetation zones, essentially the same life zones that would be encountered on a drive from Mexico to Canada. Further study has shown that there are additional factors involved with the distribution of plant communities – such as geologic substrate, soil type and depth, slope exposure, and fire history. The plants and animals seen when visiting each life zone can also vary according to the season of the year and the amount of precipitation received in that year. Nevertheless, Merriam’s Life Zones remain an important factor in determining the ultimate capability of any general area to support living organisms of a particular type. Although more detailed classifications of life zones now exist for other areas of the world, Merriam’s Life Zones are still used in the western United States. The Merriam Base Camp Site, a National Historic Landmark, is located about 2 miles north of Parks, Arizona, and about half a mile west of Spring Valley Road.